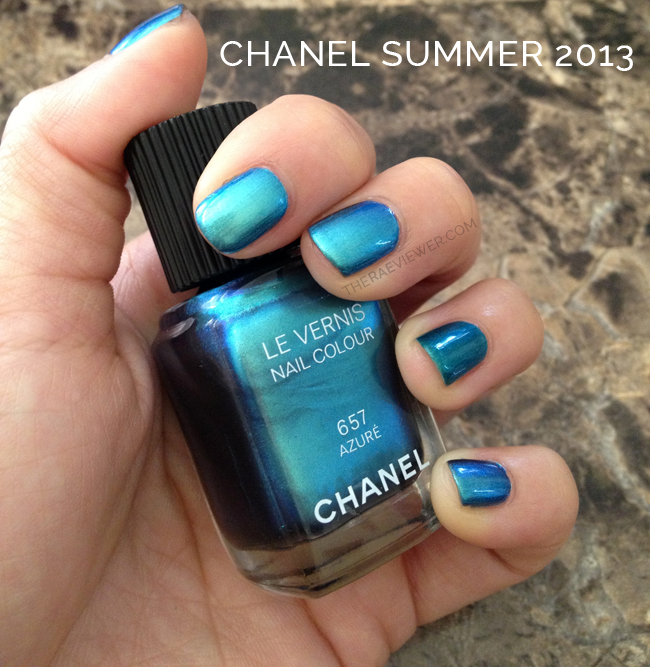 My first Chanel Summer 2013 makeup collection review post is dedicated to the lovely Azure. This is as much a review as it is a comparison post, so please enjoy! I am a sucker for green nail polish. 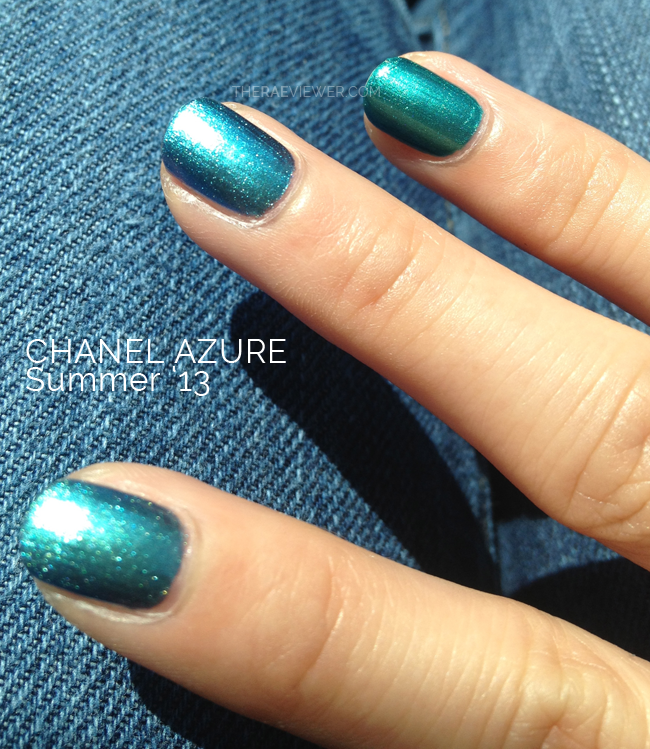 As soon as I saw the Chanel Summer 2013 press release photographs, I fell head over heels for the Azure Le Vernis. It is much less green and far more turquoise in comparison to the stock pictures, but Azure ($27 USD) did not fail to impress. See more photos after the jump! Azure is so reflective that it does not photograph perfectly true to color often. It also is a chameleon color due to the duochrome finish that is perfectly reminiscent of Chanel's Peridot, so it looks different in every lighting situation! That is why I have photographed it indoors, in the shade, in full sunlight, and all over variations possible. The transformative natural of this polish may or may not appeal to you, but I adore it! It leans from a shimmery foiled green to a solid turquoise to a bluish-green gradient.. very impressive range. Azure is two-coat perfection. There were slight stroke lines, as expected with most foil finish polishes, but my favorite Butter London Hardware top coat smoothed out the look with the high gloss effect. So far, there are no chips and the color is wearing extremely well as I have experienced with most of Chanel's special finishes. I wore it with Dior's Samba (on my ring finger), which will be discussed further in the next paragraph. But allow me to say now that as much as I love the gem shade of Samba, it does not compare in terms of Azure's vibrancy. 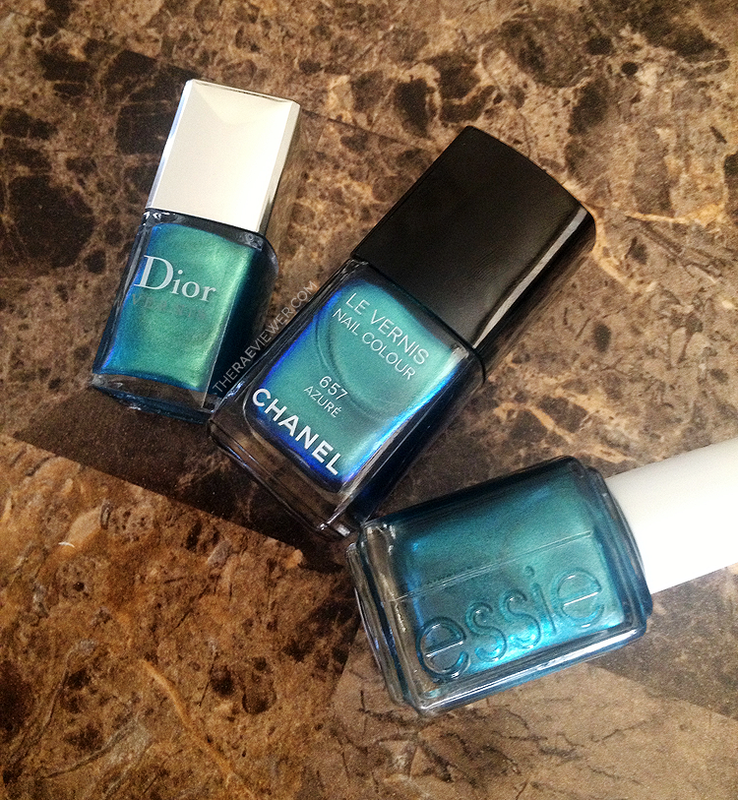 At first glance, Azure is similar to a couple other polishes in my collection, Dior Samba and Essie Trophy Wife. 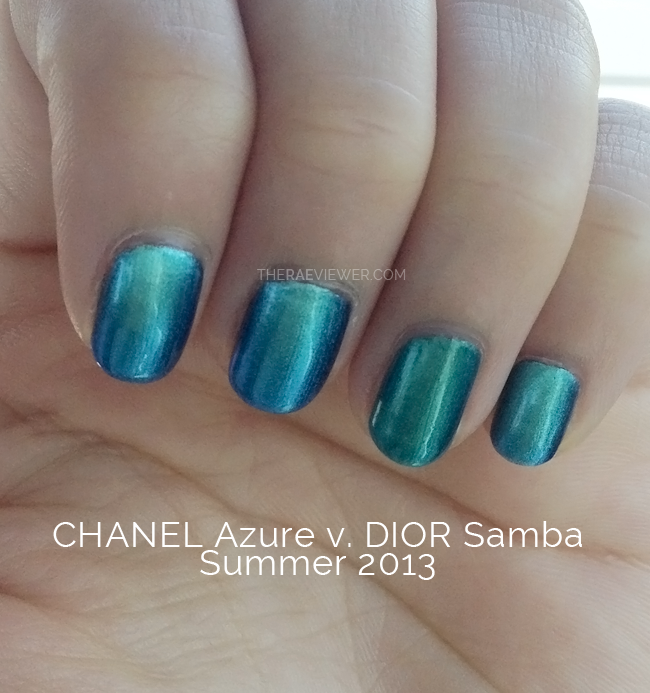 Dior's Samba is another Summer 2013 limited edition color, but it is far more green and more of a shimmery polish than the metallic foiled goodness that is Chanel's Azure. Essie's Trophy Wife is more similar to Dior Samba in both color and finish, and it dries down to a deep and dark teal, which is unlike Azure. 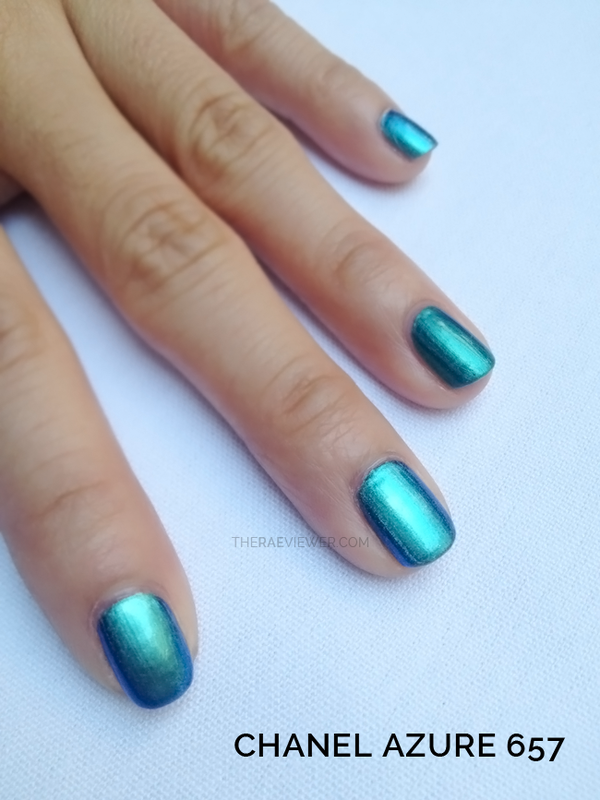 The most similar polish to Azure on the market is actually one that I do not own, a Sephora by OPI shade called Mermaid to Order. Mermaid to Order is a blue green metallic with yellow undertones and for $9.50, it is a darn close bet for a budget buy. But Azure has a heavier duochrome finish, which also leans cooler because of the silver shimmer of the foil (as seen above), and that is what makes it so special. Bottom Line: The highly reflective metallic/foiled finish is what makes Azure unique and ultimately, a must-have Chanel Le Vernis! Purchase it at Chanel counters or online here at Nordstrom.com. Oh Rae, thanks for this! I was waiting for a post like this so it's really appreciated ^^. 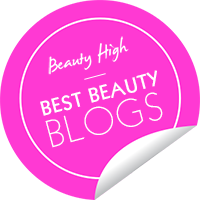 Now that you mention Essie's Trophy Wife I can see similarities with Samba. I love the glowing effect of Azure tho, it's what is taking me away. I really hope I get it soon too! 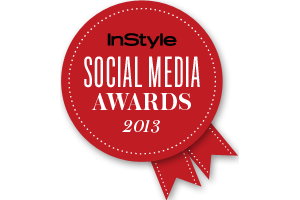 ^^ It will be released in the beginning of May here. It's definitely one of the coolest polishes I own! It's funny, I just bought the same colour from Barry M! It's a perfect dupe, at 3 euros ! I love this polish. It seems to be more unique to me, though it is difficult to tell on the computer. 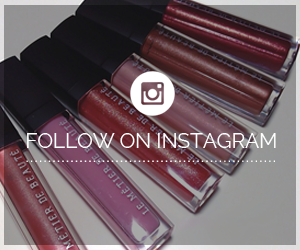 Did you get the quad yet? If so, I am looking forward to your review.